I cannot keep up with the amount of post-secondary education James Franco has received. 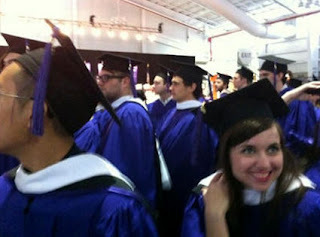 Franco just graduated from NYU - Tisch School of the Arts with an MFA in film making. He is currently also getting his PhD in English from Yale. There are lots of other academic things going on in his life that make my brain hurt...some of whoich are completed and others that are coming up. Thinking about my one degree is tiring enough. I am sticking with my theory that Franco never sleeps. I can't believe he actually went to his convocation. Those things are generally a giant waste of time...especially if you have been to 20 of them before. I love the girl in the photo who is clearly posing with James in the background. Hilarious. I would have totally done the same thing. If I was that girl, it would have been a picture of me jumping into his arms...just saying.